KUALA LUMPUR — He remains Malaysia’s longest-ruling prime minister and was one of 20th Century Asia’s most outspoken political leaders. Now Mahathir Mohamad cannot even meet opposition leader Anwar Ibrahim, a former colleague-turned-rival. The two are back on the same side, but prison authorities refused to allow the men to meet as planned on Wednesday, because “there was no official request,” according to Nurul Izzah Anwar, an opposition lawmaker and Anwar Ibrahim’s daughter. The government backed the prison official’s decision. “Dr. Mahathir has no official reason to visit,” Deputy Home Minister Nur Jazlan Mohamad told reporters. Mahathir was seeking Anwar’s support. While in office, Mahathir jailed several opposition leaders, — including Anwar, who was his deputy prime minister, as well as Lim Kit Siang, leader of the Democratic Action Party. While government ministers are accusing the opposition of hypocrisy, some local opposition party organizations have come out against proposing their old enemy Mahathir as prime minister. But if they have any chance of unseating the incumbents, they would likely have to unite — and give Mahathir their full backing. Nurul Izzah Anwar believes that despite Mahathir’s autocratic credentials, he will stick to opposition promises to make Malaysia more democratic. Mahathir’s conversion came after Prime Minister Najib Razak in 2015 was embroiled in a huge financial scandal, accused of stealing around $700 million in public money. Najib said the cash came from a Saudi Arabian donor and was largely repaid, though 1MDB, the state fund founded by Najib that was at the center of the allegations, remains under international investigation, including by the U.S. Department of Justice. 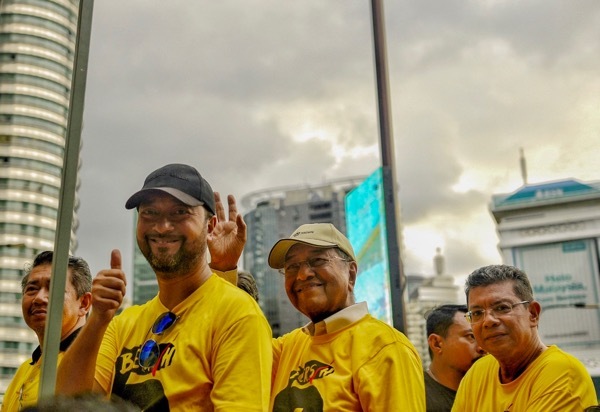 As Mahathir began to speak out against Najib, opposition-linked groups held street protests in Kuala Lumpur that Mahathir joined. The 92-year-old’s estrangement from the ruling United Malays National Organisation, the country’s biggest party that has retained power through 13 elections since Malaysian independence in 1957, may culminate in Mahathir regaining power and relegating his former colleagues to the opposition benches for the first time. But that outcome seems unlikely. Denying Mahathir permission to meet Anwar was another reminder of what the opposition sees as a rigged status quo. “We have been governed by an autocratic and unfair system for many years,” said Nurul Izzah Anwar, who pointed out that the prime minister was allowed to meet her father in November. During the last elections, in 2013, the opposition coalition, then known as the Pakatan Rakyat (People’s Alliance), won 51% of the popular vote but was gerrymandered into only 40% of the seats. If Mahathir were to somehow replace Najib, he would become the world’s oldest head of government. Despite his age, he has no problem speaking at a podium or walking the streets meeting supporters. Though economically successful, Mahathir’s tenure was tainted by allegations of ethnic favoritism, giving the country’s 68% bumiputera majority — mostly ethnic Malay Muslims — government contracts and jobs ahead of the 23.2% of Malaysians who are of Chinese descent. But that success was almost the opposition’s undoing, allowing the UMNO to claim an opposition win would put Chinese-Malaysians in control. By mid-2015, Anwar was in jail and the Pan-Malaysian Islamic Party — which competed with the UMNO for votes in the Malay-populated countryside — had defected, prompting concerns that the fractured opposition would never win enough rural Malay votes to take power.